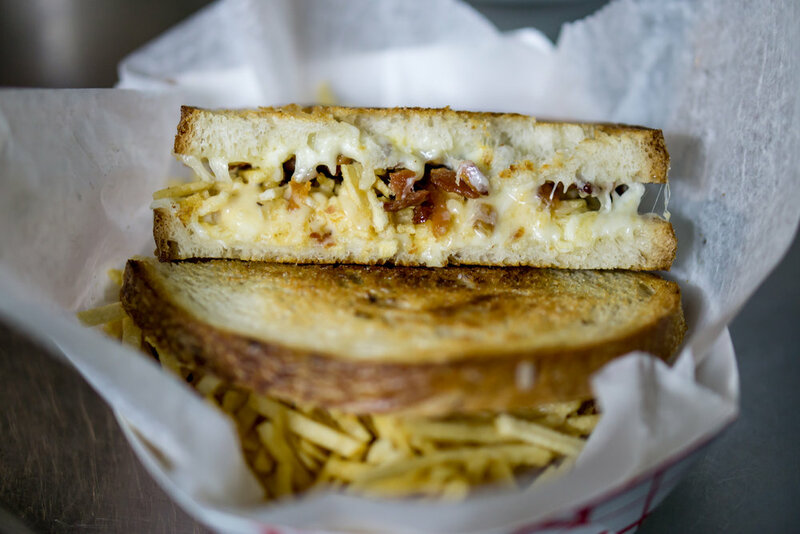 The Whey Station is a mobile food truck serving a menu of gourmet grilled cheese from classic combinations to innovative creations. We pride ourselves on making as much as possible from scratch, and using only quality ingredients with as much local products as well. The Whey Station is comprised of a husband and wife team. Jillian has a culinary degree from Johnson and Wales University as well as 12 years of restaurant and specialty food experience with a focus on gourmet cheese. Josh attended Johnson and Wales Culinary Program and has 9 years experience in restaurants and specialty foods. Together they have combined their passion for gourmet cheese and home-style cooking to create The Whey Station. Our menu is constantly changing to incorporate fresh local ingredients and to reflect our passion for creative new dishes. However, you can find a few of these staples almost always on our menu. We love being a part of the Middletown and Wesleyan Community! We are currently serving the late night crowd Thursday through Saturday Evenings from 11pm to 2am on the corner of William and High street. To find our cheesy chariot and the times we will be serving, be sure to stalk us on Facebook and Twitter. We love being a part of the community in Middletown and at Wesleyan University. You can find us at the corner of William and High Street during Wesleyan's School Year. We serve Thursday-Saturday nights from 11pm-2am. Stop by after the bar or a late night for a cheesy creation. During the summer months you can find our truck inside of Xfinity Theater in Hartford for all of the amazing concerts there. There is nothing like some tater tots and a delicious grilled cheese while watching your favorite performers hit the stage. Not up late or going to a concert anytime soon? Don't worry, our truck AND trailer are out all year long in some of our favorite spots like Bushnell Park, Coventry Farmer's Market, and more! Make sure to follow us on Social Media for our whereabouts and what we're serving. Check out our restaurant on Main Street in Middletown, CT! "If you're ever strolling around Bushnell park or at an event where the truck is parked, drop what you're doing and get in line. You will never be disappointed!" - Kristin L.
"Grilled cheese perfection. That's really all you need to know about this food truck." - Kay E.
"It's cheese on wheels. DELICIOUS cheese on wheels." - Rosanna M.
"Finger lickin' good! Unreal. Unreal. Unreal how good these things are. " - Krystle B.